We understand and appreciate the joy a pet can bring to a household. Our Springs Apartments communities are pet-friendly so all of our residents can have this wonderful experience if they so choose. Are you excited to bring a pet home but you don't know which type to pick? 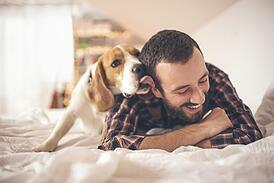 We have suggestions for a number of pets that are best suited for apartment homes. Which one appeals to you? There's a reason why these animals make the most popular pets. They each have their own individual personality and they make your heart melt with the affection they show. Yes, even cats! It's true that they can be aloof, but many of them also love to snuggle. Our Springs communities accept certain larger dog breeds, so you have a wide range to choose from. You may find that a small or mid-size dog is more comfortable and easier to handle in your home. French Bulldog, Cavalier King Charles Spaniel and Bichon Frise are some of the breeds recommended by the American Kennel Club as particularly suited for apartment living. If you want a cuddly, furry pet but you don't have enough time for walks and other exercise, one of these animals could fit the bill. Keep in mind that hamsters and guinea pigs are nocturnal, so place the cage in a spot where it won't interrupt your sleep time. With their beautiful feathers and variety of colors, birds are almost a decor element as well as a pet. Cockatiels and parakeets, also known as budgies, are the most popular pet birds due to their playful and affectionate nature. Cockatoos, parrots and macaws will mimic human speech, and some even sing and hum! Bright colors and unusual shapes make fish another type of pet that adds style as well as companionship. Watching fish swim gently around the tank is a well-known stress reliever, so that may play a part in your choice. Laws vary from state to state, so be sure to check local ordinances before choosing one of these exotic pets. Share your funny or cute pet stories with us in the comments!